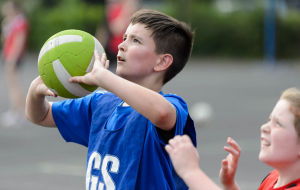 Check out the coach bursary grants and loans page for funding support for coaches. • Invest in opportunities that reach different audiences and address barriers to engaging in the sport. 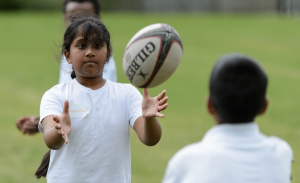 • Recognise the role and value of Rugby League activity in the community and support delivery of wider benefits such as community cohesion, civic pride and social development. • Ensure they deliver a lasting legacy that will provide opportunities for engagement in the sport now, that will continue to be deliverable in the future. The Programme is focused on funding for facilities and equipment. They want to work with any organisation that is developing Rugby League activity in their community. Grants are small-scale awards from £1,000 - £15,000 and large-scale over £15,000 from a total funding pot of £10m. Applications can be submitted at any time and decisions will be made approximately every 12 weeks. The fund will close for new applications: 23 October 2021. The Football Foundation run a number of different grant funding programmes. For the best advice about these programmes it is advisable to contact the Nottinghamshire FA. 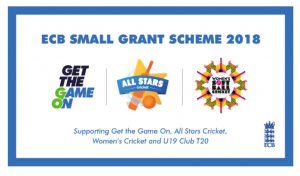 In 2018, the ECB Small Grant Scheme aims to support the ECB's national programmes - Get the Game On, All Stars Cricket, Women's Cricket and U19 Club T20. 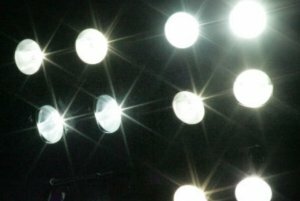 Clubs should contact their local County Cricket Board (CCB) to receive an application form and guidance notes on how to apply. 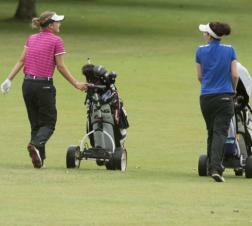 England Golf Trust is a charitable trust supported by England Golf. It provides grants and bursaries for boys and girls (under 21 or in full-time education) who need financial help to play the game. The aim of the England Golf Trust is to help young people in financial need who, without its support, would not be able to play golf. Click here to find out more about the various bursaries and grants available through the Trust. 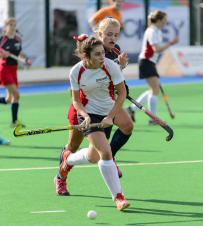 The National Hockey Foundation primarily makes grants to a wide range of organisations that meet one of their chosen areas of focus which includes "young people and hockey", "enabling the development of hockey at youth or community level" and "smaller charities". Grants can be awarded for medium to long-term projects (i.e. over one year) or for shorter term one-off projects. A maximum limit of three years of support can be provided (either an instalment grant or three separate applications). Grants are not usually awarded for more than 50 per cent of the project costs and are generally awarded quarterly. There is no limit on the amount of money that an organisation can request. However, the Foundation does not generally award grants for less than £10,000 or more than £75,000. East Midlands Netball will support their affiliated members by providing subsidies and mentoring opportunities to help develop coaches / tutors / umpires / volunteers / players across the region. Funding requests for UKCC Level 1 and C Umpire courses should be made directly to the County Netball Association. Applications will be considered at meetings throughout the year and should be submitted, where possible, prior to the start date of a course. The Rowing Foundation's purpose is to promote the participation in rowing of young people (those under 18 or still in full time education) and people with disabilities of all ages. The Foundation gives grants of £500-£3,000 (up to 50% of the cost) to help organisations and clubs involved in on water elements of the sport of Rowing who are individually affiliated to British Rowing (other than via their governing body). Funds are limited and statistically the Foundation favours giving grants for equipment that will be used on the water and exclusively for juniors and the disabled of all ages. The last deadline for 2017 has now passed. However, check their website for new deadlines in 2018. The 'Helping Hand Grant' provides a mechanism for clubs to apply for a small grant of between £500 - £1,500 for eligible capital projects (for example a new set of rugby posts, redecorating the changing rooms etc) with the club matching the grant on a £ for £ basis. 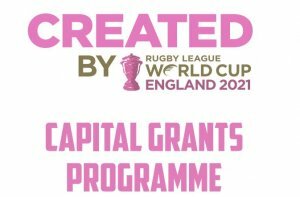 The Interest Free Loan scheme provides up to £100,000 in an interest free loan to capital works to clubs at level 3 and below which contribute to the retention and recruitment of community rugby players. 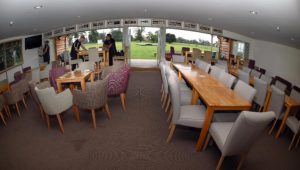 RFF Green Deal loans up to the value of £20,000 are available to clubs to support them in the installation of facility solutions that reduce utility costs. Green Deal Loan repayments are structured to be the equivalent of the projected savings over the agreed 'payback' period. 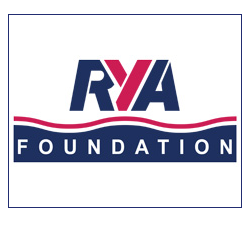 The RYA Foundation is the charitable arm of the RYA. It has the objective of making boating more accessible to everyone, regardless of circumstance. To apply for a grant from the RYA Foundation please read the attached Grant Guidelines before completing a Grant Application Form. Applications for grants up to £3000 may be submitted at any time and will be processed by the Trustees on receipt. Applications for grants over £3000 are considered at the next Trustees meeting. This date will be advised following receipt of a grant application. The BMC has provided a list of organisations, Trusts, commercial companies and charities that are able to provide funding support for trips. Be sure to check out each organisation's awarding criteria carefully before making an application to avoid disappointment. Click here to go to the BMC's website for more information. All clubs affiliated to Bowls England are eligible to apply for a Club Loan up to £20,000 (free of interest), repayable over up to eight years. The loans can support projects relating to e.g. clubhouse improvements, fencing, car parks and changing rooms. Applications must be made before any work on the 'project' starts and should be made in the first instance to Bowls England with details of the project, its total cost and how it is envisaged that the costs will be funded. 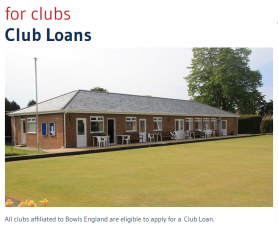 All clubs applying for a Club Loan must have been affiliated to Bowls England for a minimum of three years and should any club in receipt of a Club Loan cease to be affiliated during the repayment term, the full loan amount becomes repayable immediately. 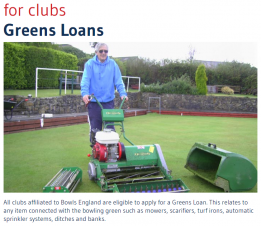 All clubs affiliated to Bowls England are eligible to apply for a Greens Loan. This relates to any item connected with the bowling green such as mowers, scarifiers, turf irons, automatic sprinkler systems, ditches and banks. Applications should be submitted to the National Co-ordinator of the Bowls England Green Maintenance Advisory Scheme. 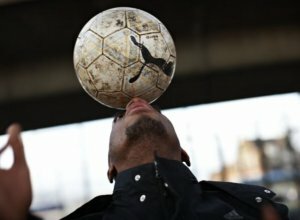 The maximum loan is £5,000 for any one item, but a club may have more than one loan if it is purchasing more than one item. Loans must be repaid by monthly instalments over 12 or 24 months and the loans are free of interest. However, there is a small documentation fee towards Bowls England's administration costs. Please note that if the total Greens Loan is £5,000 or over then the club also need guarantors. The England and Wales Cricket Trust (EWCT) Interest Free Loan Scheme provides finance to clubs for capital projects to help them build and ensure a sustainable future. All ECB affiliated cricket clubs as well as other organisations that can evidence achievement/delivery of the EWCT's charitable aims. ECB Clubmark registration or accreditation is not a requirement when applying. A minimum of 10% match funding is required. Want to know more? Have a look at ECB's technical guidance on fine turf. Want to know more? Have a look at ECB's technical guidance and list of ECB approved non-turf pitch systems and suppliers. 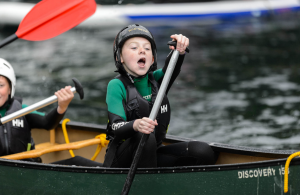 The main purpose of the Canoe Foundation is to "support all to enjoy and benefit from the experience of paddling on our water in a sustainable manner". The Foundation does this through grant making that facilitates improvements to suitable landing and launching points and by promoting the conservation of inland waterways for the benefit of all sectors of the community. New or improved launching points in urban or rural locations or as part of a water trail, such as steps or pontoons. Linked promotion of access points including signage or maps to increase participation and use. Improving the quality of the waterways and oceans through support, for example practical kits, for a clean-up or an improved natural habitat. The Foundation invites applications for grants ranging from £2,000 to £20,000. Applications are considered on a quarterly basis with the next deadline for applications being the 31st January 2019.